I’m sure we’ve all been in that situation. We’re scrolling through our feeds in our many different social media platforms, only to see that someone has posted something completely…STUPID! I mean, what are they thinking?? Maybe they’re fishing for attention, or posting ridiculous pictures, or maybe they have the AUDACITY to share some parenting advice, or even worse, MISSPELL a word! We won’t even get into the subject of POLITICS, right?? I mean, what are these people thinking clogging up our feeds with utter stupidity? There is only one thing to do in a situation like this…. 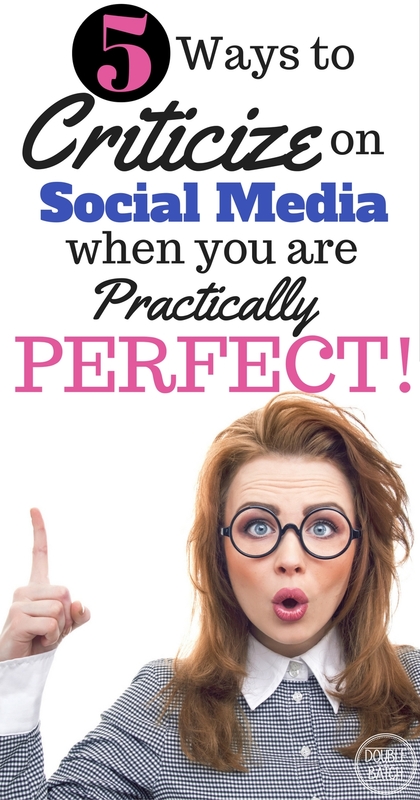 You must correct them, set them right, and perfect this world of social media! Follow these 5 steps, and you will not only be admired for your incredible knowledge on just about every subject, but people will begin to think twice before ever updating their status again! Diligently SEEK. Be sure to diligently stalk your social media accounts every hour of every day. You never want to miss the perfect opportunity to criticize others or set someone right. ATTACK when the moment is right! It’s important to be one of the first people to comment so as to steer the conversation in your favor. Show no Mercy! Be prepared for your ‘friends’ to defend themselves. It’s only natural for them to be offended by your intelligent remarks and want to defend their status. STAND YOUR GROUND! After all, you are practically perfect in almost every way, and they will eventually realize this and back down. Spread the word. Be sure to share others ridiculous posts and let the world know just what you think about them. You never know when something will go viral because of YOU! Applaud your success. Don’t be discouraged when your followers start to drop away. There’s always more where they came from, right? What’s important is that you are ‘teaching’ everyone how to appropriately live their lives and not putting up with their stupidity. They may hate you today, but someday they will thank you for setting them on the right course! As ridiculous as the previous scenario and tips sound, I think they hit home for a lot of us. Maybe we’ve been the ones who have criticized one too many times, or been attacked for our beliefs or posts on social media. For most of us, I’m sure it’s a little of both! It’s natural to want people to see our best selves on social media, and it’s also natural to want to criticize when others believe differently than we do. There is something wonderful about social media that allows us to connect and keep in touch with so many people, yet there is also something about social media that disconnects us just enough to think it’s ok to criticize, demean, and even attack others. Why do people feel the need to argue, bully, and criticize others words online constantly? I think it all comes down to 2 reasons: We want to look GOOD, and we want to be RIGHT! Somehow that makes us feel better about ourselves, right? I mean, if someone else is wrong, then that makes us right, and if someone else is clueless, we must be smart! What if we all pretended that we were actually standing face to face with each other before we typed anything in a reply? What if we allowed others their beliefs, and agreed to disagree but always insisted on LOVING first? What if our first and foremost goal everyday was to uplift and inspire rather than criticize and demean? Can you imagine the POWER that social media could have on others? I love this cute video clip as it reminds me to look inside myself before I judge others. Our world today is falling rapidly when it comes to morals and values. I’ve heard many parents say that they don’t want to have children because they can’t imagine forcing a child to live in what seems like a hopeless world. The news is filled with sadness, terror, and destruction all over the world. Then we turn to social media only to leave feeling uninspired. It’s no wonder the suicides have sky-rocketed, drug abuse and alcoholism are increasing dramatically, and families are being ripped apart. The power of ONE is great! NO longer do we live in a disconnected world. With the touch of a button we can choose to inspire or put down, to change or give in. Imagine the mother who chooses to TEACH and INSPIRE her children so that they can be the SOLUTION to our falling world! Imagine the person who fills their feed with uplifting quotes and memes and by so doing spreads light to not only others, but also themselves. When you go to the grocery store, do you smile and uplift the person scanning your groceries? When you go to church or school, do you notice the people who look like they are carrying a heavy burden and seek to comfort? I am so guilty, at times, of NOT doing these things and getting caught up in my own stresses of life. Do I criticize others? Unfortunately, yes, because I’m human. Yet, when I look outside myself, and try to see life through a brighter lense, try to be grateful rather than angry and serve more than take, my life brightens and I feel better about myself and about the future. Let’s strive to uplift, love, and serve, and as we feel the JOY from that, let’s make it go VIRAL people!